We recently found an app in the Social Networking category on the App Store and it was a true discovery! Eyetok is an amazing iOS app that allows you to see everything that is happening in the world and gets you excited and entertained immediately after you download it. This app has the most unique features ever, which we will prove of in this review. Eyetok turns your device into a walking webcam and enables you to stay in touch with the rest of the world. 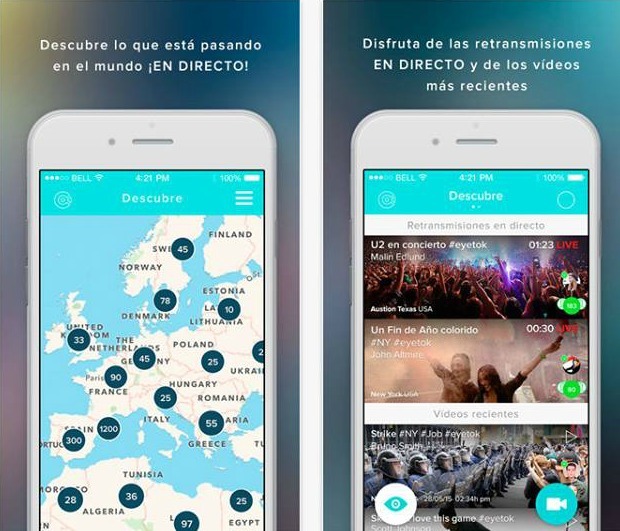 Stop wondering what is going on in your city or even on the other side of the world and enjoy the live streams that people are posting within this app. You can now watch any gig, sporting event, concert, party, weather, traffic jams, etc. Everything is available – from normal daily moments to memorable once in a lifetime moments. Follow more people from all around the world and discover their lives, but also let other people follow you and see what you’re seeing. Real time interaction is also included, meaning you can guide the broadcaster with arrows and start a conversation. Stream and re-stream and let the world get in your pocket. Eyetok brings the world at your fingertips. You can download this astonishing and one of a kind app for free on the App Store.